The City of Waconia will be recognized at the APWA North American Snow Conference with an APWA Excellence in Snow and Ice Control Award for 2015. APWA established the award to promote excellence in the management and administration of public works snow and ice operations, and to promote best practices in snow and ice removal while minimizing environmental impacts. Waconia is a growing community of 11,065 people located just 30 minutes west of the Twin Cities of Minneapolis and St. Paul in an area popular with visitors for the many lakes, streams and wetlands. The city’s parks are enjoyable destinations within easy reach. The city is nestled next to scenic Lake Waconia, which is the metro area’s second largest lake, and offers residents a healthy environment as well as growing economic development, strong schools and excellent health care facilities. Lake Waconia is not only a popular spot for visitors, but an integral part of the lives of its residents. In the summer, Lake Waconia hosts a multitude of recreational activities such as, sailing, boating, fishing, water-skiing, tubing, jet-skiing, and swimming. In the spring, late summer and fall, seasonal winds attract wind surfers and sailboarders. In the winter, snow accumulations amount to around 45 to 55 inches starting in early November and ending as late as early May, making it a haven for snowmobilers and Lake Waconia draws hundreds of ice-fishing houses forming a community of anglers. City employees actively maintain and improve the city’s environment and infrastructure. In the winter season, workers oversee approximately 48 center-lane miles of roadways, all municipal parking lots, and 27 miles of trail and sidewalks. The state of Minnesota has set forth high expectations for reducing chloride applications in effort of protecting the wetlands, streams, and lakes for recreational use. All the while maintaining a level of service allowing individuals to travel to and from work, and provide the business sectors commerce to meet customer expectations. In 2010, the city of Waconia made significant changes in winter maintenances practices to meet the state expectations. 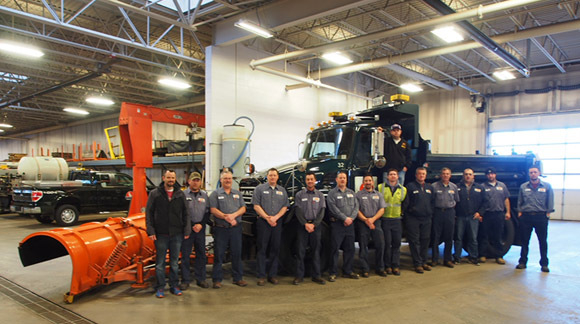 The city of Waconia was the first community in Carver County to utilize liquids in winter maintenance operations. Brine production and anti-icing were implemented into the community’s winter maintenance practices. Increases in calibration, education, training, and community outreach were also added. As a result, Waconia has been supplying liquids since 2011 to three neighboring communities, Carver County, cities outside of the county, and private contractor’s. Each entity is charge our material purchase price, costs associated with blending and staff time. Providing winter maintenance with an environmentally sensitive approach is critical to public services operations. Reductions in chloride application rates due to education of staff, liquid uses, and equipment improvements will hopefully provide a positive approach.